COLORS OF NATURE Tree-Free, Chemical-Free, Sustainable Paper for Art, Crafts, Office. Banana, Lemon, Mango, Coffee, Bamboo Sources. DAISEYE Stationary, Birthday, Congrats, Sympathy, Get Better Cards etc, Handmade, Recycled Papers. ECO 4 LESS Greg Barber - Environmental Printing Using Recycled Paper and Non Toxic Processes. GREEN FIELD PAPER COMPANY Handmade Grow-A-Note Seed Embedded Paper Using 100% PCW, Hemp Heritage Paper, Made in USA. OF THE EARTH Handmade Paper Wedding Invitations and Seed Paper for Personal and Business Use. If everyone in the U.S. said "no thanks" to ATM receipts, it would save a roll of paper so long it could circle the equator fifteen times. If every household in the U.S. replaced just one roll of virgin fiber paper towels (70 sheets) with 100% recycled ones, we could save 544,000 trees. 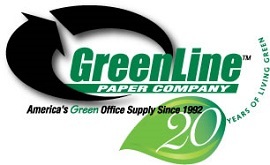 Using old paper to make new paper uses 30 to 50 percent less energy than making paper from trees. The Paper pulp and paper industry is the 4th largest contributor to greenhouse gas emissions in the U.S.
To make one ton of paper towels, 17 trees have to be destroyed and over 20,000 gallons of water are polluted.